I opened this bottle over the weekend and was very, very pleased. I don't drink a lot of Rieslings (the shame follows me everywhere) but this one has made me reconsider that direction. What a gorgeous wine. A friend and neighbor had a gathering with homemade summer rolls and a BYOB invitation. I brought the Clüsserath Trocken (Trocken means dry) riesling from the Mosel region in Germany, known for producing the world's best rieslings. This is in part for the unique slatey soils found on the steep banks of the Mosel river. The vineyards there are precarious, with a loose top soil and terraced rows of vines often at a forty-five degree angle, making machine harvesting an impossibility. The soil retains heat, warming the vines during long sunshine hours, while the substrata holds water, a combination riesling adores. The Clüsserath family has been making wine since 1670, and presently by Ansgar's daughter, Eva Clüsserath-Wittman (her husband, Philip Wittman is also a winemaker). Eva's approach to winemaking is very natural, with minimal intervention in the winery and a dedication to traditional methods, including slow, natural fermentation in 1,000 liter Fuder barrels. 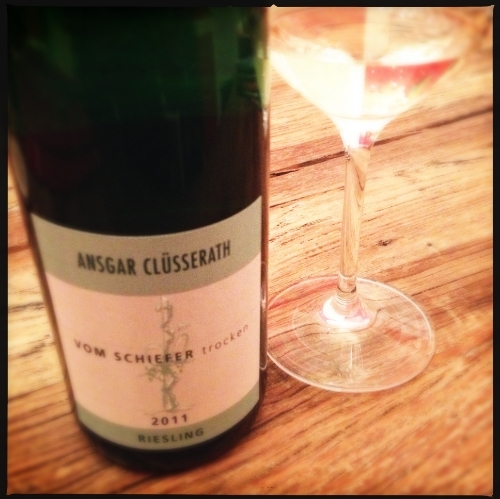 Ansgar Clüsserath Vom Schiefer Trocken Riesling 2011 Unmistakable aromas of classic Riesling petrol and white fruits jumped from the glass. Another swirl and hints of mineral and slate (vom schiefer means "from slate"), a touch of smoke and white peach followed. Excellent, gentle acidity - high, as one expects in Riesling, with notes of peach and grapefruit and mineral on the palate and a long, lovely, completely dry finish.